Our roots are in the outdoors and this is where they remain. A few years ago we returned to our roots when we moved our headquarters to Post Falls, Idaho – right in the heart of some of the finest outdoor activities in the country – hunting, fishing, camping and hiking. These products were inspired by the outdoor life that we all love and enjoy. Ergonomic design, improving hunting performance. The ErgoHunter Small Game™ series of knives have a new, innovative design exclusive to comfort and control for hunters needing a reliable small game knife. The small Wharncliffe blade is designed with a dull backbone that allows the blade to be held with a finger for maximum control. With multiple blade steel options and handle materials, this knife will be the choice of any hunter. 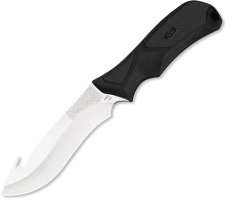 This knife is built for comfort and control, while utilizing a superior grip. This smaller knife design is based on the primary gripping positions during use, to reduce hand fatigue and increase hunting performance.